The sprint is completed on the day of its end date. This event will update important gadgets like Sprint Burn down chart and Velocity Chart. 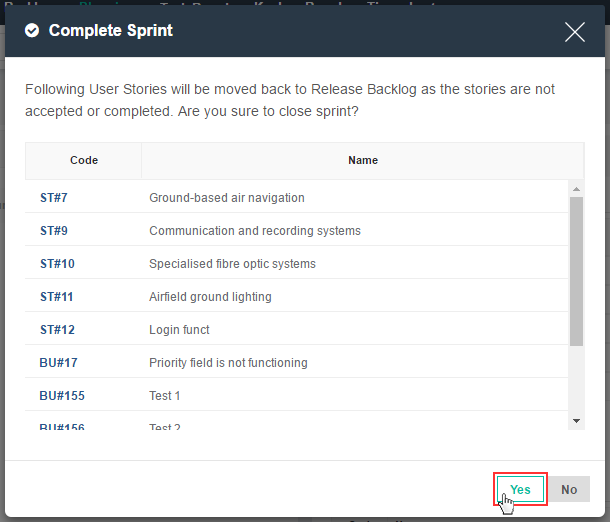 Sprint can be completed using Sprint Planning page and Scrum Board. 1. Access Sprint Planning from header menu. 2. Select Sprint under Sprint section to complete the sprint. Sprint can also be completed from Scrum Board. 2. Select Sprint to complete sprint. 3. Click on Complete Sprint to complete sprint.